Energy dashboards, the latest addition to UConn’s top-ranked green campus, are interactive kiosks that allow anyone to explore real-time electricity, water, steam and chilled water usage statistics. This “green touchscreen” technology has been installed in both Laurel Hall and Oak Hall. It is available to any student, staff or faculty member. By touching the energy dashboard display, anyone will be able to discover how many gallons of water have been consumed so far in a day, or the number of gallons of water that were used the day or two before. 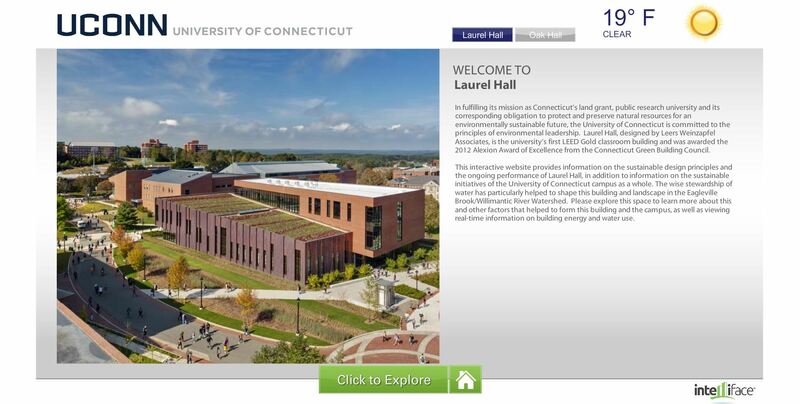 A student, staff or faculty member would also be able to explore the sustainable features of the building, as well as all of the sustainable initiatives of the University of Connecticut campus as a whole by touching the green campus tour widget. Better still, the energy dashboard does not only have to be accessed in person. Anyone can access the energy dashboard online. 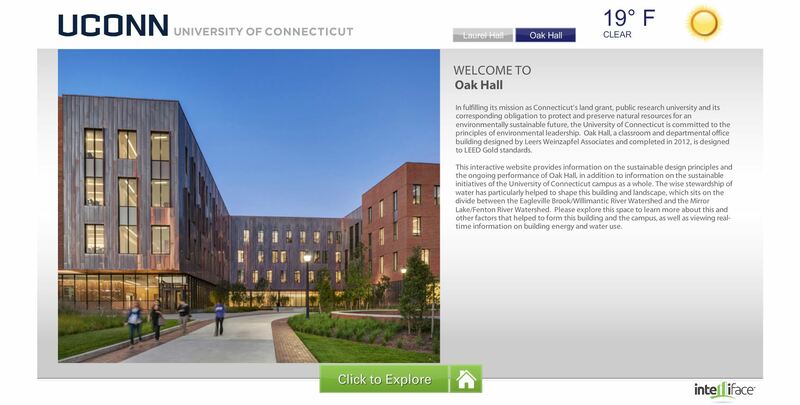 By visiting the interactive website, anyone can explore information on the sustainable design principles and analyze trends in water, electricity, steam and chilled water usage – the same information that can be accessed at the kiosk in Lauren Hall and Oak Hall. The energy dashboards not only serve as an extraordinary educational tool, but they raise awareness about our environmental impact. By making real-time energy statistics available to the community, both students and staff will be able to apply conservation tips to their own lives and ultimately make a difference in reducing the size of the University’s carbon footprint. Our analysis of similar installations at other colleges and universities has shown that the most widespread use of dashboards and touchscreens occurs when faculty members, from a variety of disciplines, incorporate class projects that utilize them into their syllabi. We encourage UConn professors to take full advantage of the new dashboards as teaching tools for environmental sustainability! If you’ll let us know how you plan to use them in your class, we’ll maintain and publish an inventory of different academic applications. We’d also appreciate your comments and suggestions for improvement about the content and user-friendliness of the dashboards. Please send your input and feedback to envpolicy@uconn.edu. 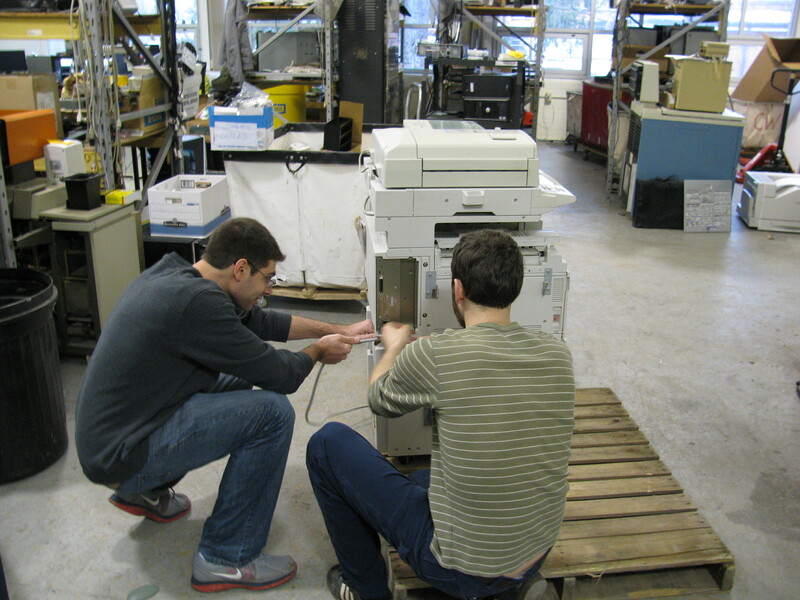 Surplus Department Helps UConn Reduce, Reuse, and Recycle! UConn’s Surplus Department plays a significant role in helping the University achieve its environmental goals, especially when it comes to waste reduction and recycling. The main objective of Surplus is to help all University departments properly dispose of University property—furniture, electronics and equipment that are no longer needed or serviceable. Surplus works in conjunction with Central Stores and both departments are part of Logistics Administration. Although we typically think of recycling when we see the three arrow symbol, the real meaning is the “Three Rs” of the waste hierarchy: reduce, reuse and recycle. Often, the OEP focuses on outreach aimed at changing individual behavior in order to increase recycling of everyday items, like bottles, cans, paper and cardboard. This past year, we’ve collaborated with the Surplus Department to raise awareness about the benefits of institutional efforts across the entire waste hierarchy. Surplus services translate directly to increases in the Three Rs and better quantification and reporting of these benefits have helped UConn reduce its environmental footprint and achieve the #1 ranking in the 2013 Sierra Club Cool Schools survey. Special thanks to Annemarie Ryan of Surplus and Central Stores for writing and contributing this informative post about how her department helps UConn reduce, reuse and recycle! The Surplus Department’s first task is to reduce the number of items that are purchased by recirculating existing extra (or surplus) items. Surplus items are transferred to and from departments—tables, chairs, cabinets, lab equipment, electronics, and more. In addition to sparing the environment, this saves taxpayers money; receiving departments do not spend state funds buying new items. University employees are welcome to visit the Surplus Showroom to “tag” furniture, electronics, and equipment for departmental use at no cost—a great way to reap savings and spare already stretched budgets. The Depot Campus Showroom located at 6 Ahern Lane is open every Tuesday and Thursday from 1 to 3pm. The Surplus Department supports reuse by selling items at the Public Surplus Store. “Much of the furniture and equipment gets a new life, either by being used by other departments or sold at our Public Surplus Store,” said Joe Hollister, Surplus Supervisor. The Public Surplus Store located on the Depot Campus at 6 Ahern Lane is open 10am to 3pm on the second Friday of every month. It is open to all University staff, students, and the general public. Only cash payments are accepted. 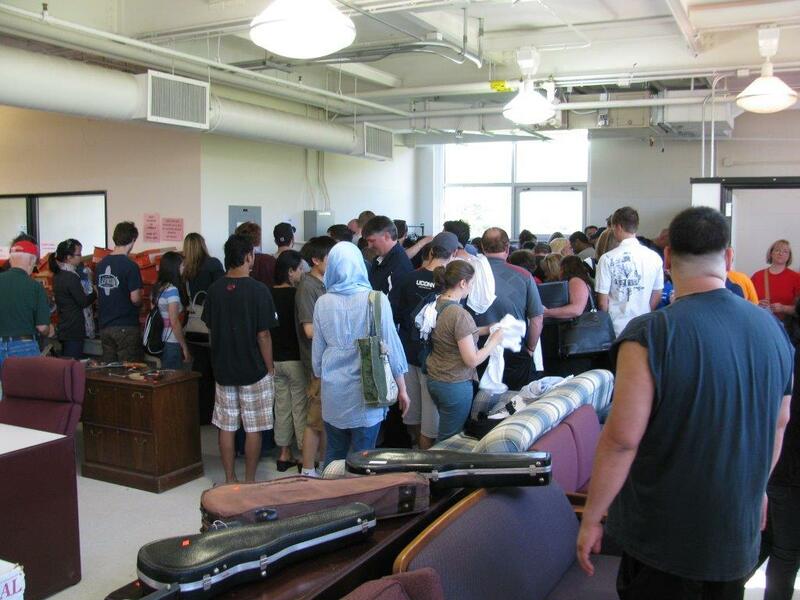 Crowds looking for deals at the monthly Public Surplus Store sale. Finally, the Surplus Department recycles what cannot be reused. Other surplus is recycled to certified recycler companies. Last year alone, the Surplus Department recycled 230 tons of obsolete equipment and 84 tons of electronic waste (e-waste). E-waste consists of damaged or discarded electronic devices and associated materials. E-waste items cannot be discarded in regular trash due to their high concentrations of toxic chemicals and heavy metals. Some of the e-waste recycled last year: computers, monitors, office equipment, cell phones, blackberries, and television sets. In addition, Central Stores provides a pickup service to departments for recycling their used printer and fax toner cartridges. Over the past three years, more than 9,500 cartridges have been recycled using this service. As part of the University’s ongoing environmental stewardship efforts, Logistics Administration, including the Surplus Department and the Document Production Center, has partnered with the Office of Environmental Policy to improve an important component of the University’s e-waste program. New e-waste recycling bins designed by the Document Production Center are conveniently located at highly visible and well traversed areas, including the Student Union, the Co-op, and Homer Babbidge Library. Each location has one bin for inkjet cartridges, a second bin for batteries/laptop batteries, and a third bin for cell phones. The entire University community—students, staff, and faculty—are encouraged to use the new e-waste recycling bins to keep their e-waste out of landfills. For more information about e-waste recycling and the new recycling bins, please visit: http://ecohusky.uconn.edu/recycling/ewaste.html. Last summer, Surplus ran a very successful cleanup campaign. Departments were given a special opportunity to easily dispose of their surplus. Surplus employees went to departments’ locations, completed paperwork, and picked up surplus—all in one shot. 88 surplus pickups received and processed from almost as many departments. 27 pallets of e-waste recycled—roughly a full tractor load weighing about 15.5 tons. Per Public Act 91-256, the University has the authority to dispose of surplus, unused and/or unserviceable equipment and supplies. Proper disposal of University property is required pursuant to Section 4a-77a of the General Statutes. Surplus Management determines if items sent to Surplus will be recycled to the University or discarded. After 30 days, surplus not selected for transfer to another department may be sold at the Public Surplus Store. University property can never be discarded without approval by Surplus Management. To obtain surplus, departments complete an ACT 39 Form, available at the Surplus Showroom. To send items to Surplus, departments complete an ACT 39 Form or use the KFS Capital Assets System. For complete information about Surplus procedures, visit the Central Stores website or contact Surplus at 486-3094. Fevers, aches, and sore throats are spreading throughout the country as another flu season begins. The Center for Disease Control and Prevention advices flu vaccinations and healthy hygiene practices. Traditionally it has been encouraged that hands be washed thoroughly with soap and hot water. However, National Geographic recently released an article that dispelled the use of hot water to kill bacteria while washing hands. The article cites a study conducted by Vanderbilt University that found while hot water does indeed kill bacteria, it requires temperatures that far exceed what is used for hand washing. 212°F is needed to disinfect water from pathogens but hands are usually washed in temperatures ranging from 104°F to 131°F. Therefore, the hot water used to wash hands will not significantly reduce germs. In fact, it is believe that it may do more harm than good because it can remove the upper layer of skin and make the body more susceptible to bacteria. And in addition to it having no health benefits, warm water is also very wasteful. It has been estimated that Americans contribute 6 million metric tons of CO2 emissions annually by washing their hands with hot water. This is comparable to the emissions of an astounding 1,250,000 vehicles. Simple lifestyle changes, if made by a large population, can considerably benefit the environment. This includes unplugging technological devices when not in use, carpooling with friends and family, turning off the faucet while brushing one’s teeth, and purchasing local foods. Now we have something additional to add to that list: wash your hands with cold water. But this is not the only place to shift the use of hot water to cold. In the United States 15% of energy used in households can be attributed to hot water heating. A Norwegian study found that reducing temperatures from 104°F to 86°F while washing clothes, will reduce energy consumption by 30% while still just as effectively cleaning the clothes. This heat reduction is not only sustainable but also cost effective. For every 10°F drop, approximately 3-5% of water heating costs can be cut. So, stay healthy and be sustainable. Get your flu shot and wash your hands well with soap. Do not, however, turn that hot water knob. You’ll save a few bucks and reduce your carbon footprint!